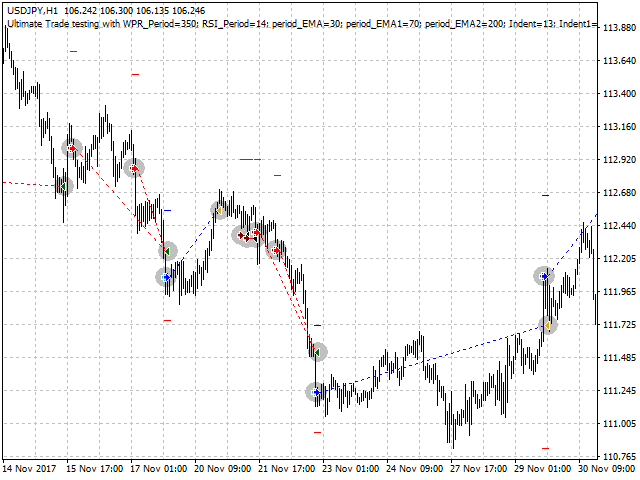 Ultimate Trade is a fully automated trading robot, which can trade any currency pairs on any timeframe. You can start with any initial deposit. The Expert Advisor operation is based on the market analysis using indicators. The EA opens only pending orders. Suitable for 4- and 5-digit quotes. The robot can be attached to multiple instruments at the same time. For this purpose, the required number of charts is opened in the terminal, and the EA is attached to each chart. In this case, the robot considers the total number of deals using the "level" parameter, which limits the total number of deals by the level of the account free margin. Entry volume and risks are tightly controlled by algorithms. The number of trades is limited by free margin in percent, which by default is 1500% (the 'level' parameter = 1500.00). Market entry volume depends on the amount of free margin or the account balance if there are no trades. The trade volume also depends on the risk level specified in input parameters (MaximumRisk is set to 0.005 by default, i.e. the volume is calculated so that if a trade becomes losing, the maximum loss on such a trade is limited to 0.5% of the account balance. Trade volume also depends on the stop-loss level. 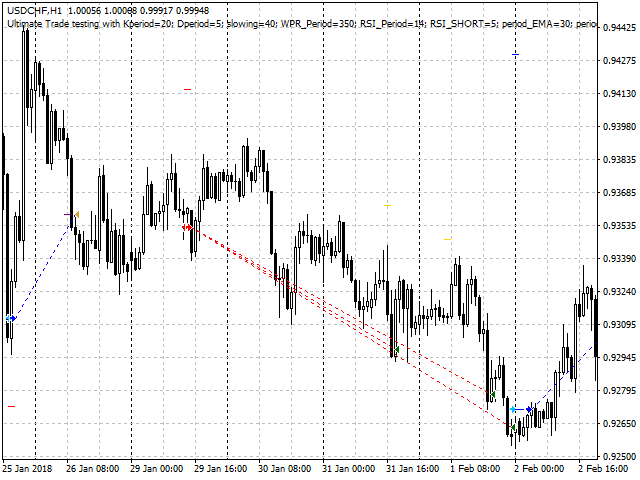 The stop loss level is calculated automatically for each trade, depending on the support and resistance levels. All input parameters in the Expert Advisor are set for accounts with quotes having 4 decimal places, but these parameters also apply to accounts with 5 decimal places, i.e they are recalculated automatically. For example: TakeProfit = 150, .e. for accounts with 4-digit quotes the TP level is 150 points, and for accounts with 5-digit quotes the TP level is 1500 points. After triggering of a pending order, the stop loss level can also be deleted by changing Trailing2 = true in the input parameters (Trailing2 = false by default). 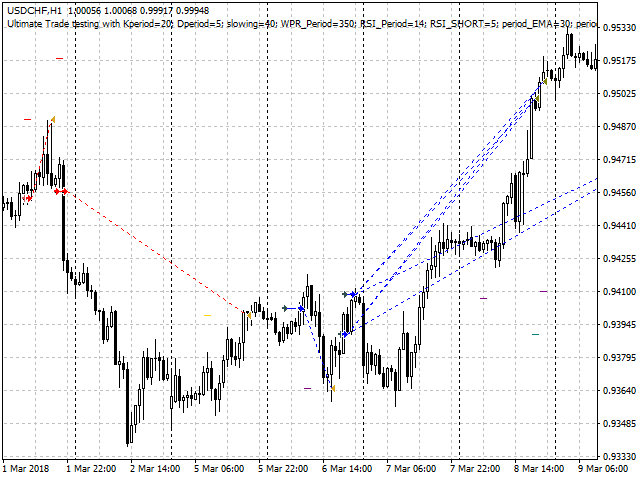 Trades are closed both by reaching the TakeProfit level and by various internal algorithms. When closing a deal by algorithms, half the volume is closed, while the remaining part is transferred to breakeven. 1. Now when closing a deal, half the volume is closed, while the remaining half is transferred to breakeven by moving stop loss to the order opening price. The position will be closed this way until all of its volume is closed. 1. 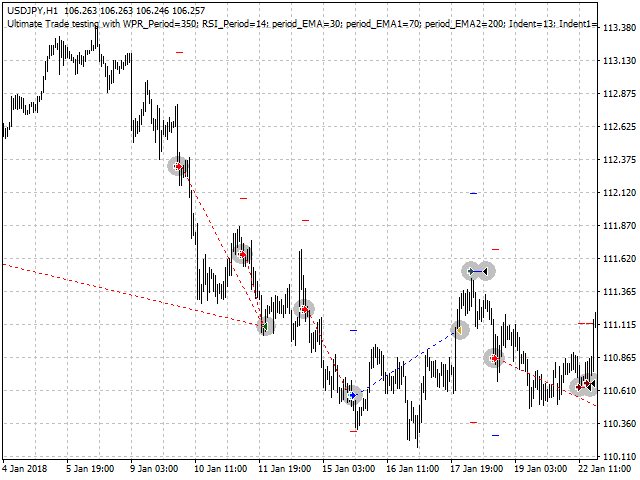 Added opening of trades based on the "stochastic oscillator" indicator. 2. 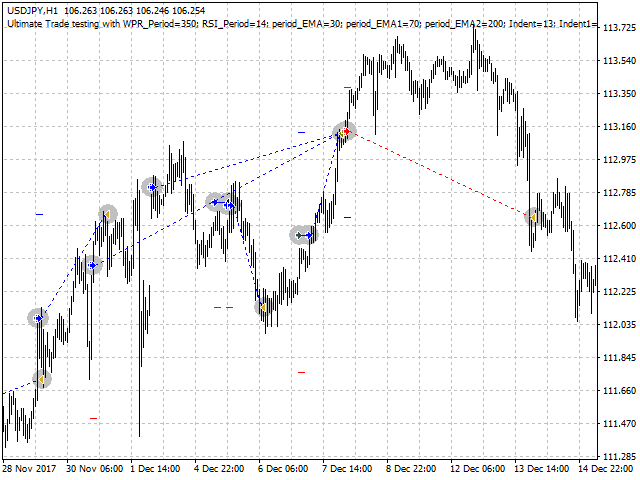 Improved closing of trades based on various algorithms.